DONORS NEEDED! 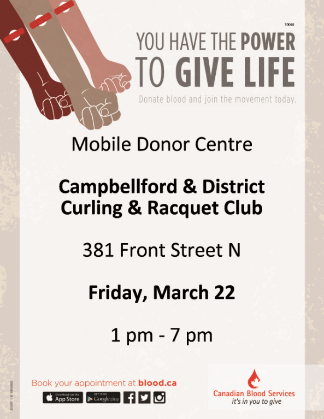 Donate at the Campbellford & District Curling & Racquet Club (381 Front Street N.) on Friday, March 22 from 1:00pm-7:00pm. Grab a friend or classmate and donate together! Book your life-saving appointment at www.blood.ca, call 18882DONATE (236-6283), or download the #GiveBlood app. Book your appointment at www.blood.ca or call 1-888-236-6283.